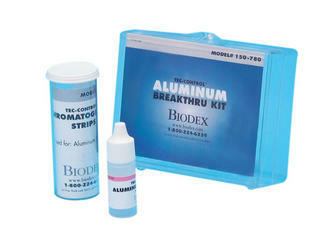 The Aluminum Break­thru Kit provides a ra­pid, easy and inexpensive way to test aqueous solutions, particularly per­tech­netate generator eluate, for trace quantities of alu­minum. Aluminum forms an intense red precipitate with the indicator paper, and the intensity of the color is directly proportional to the amount of aluminum in the solution. The USP allows a concentration of aluminum ion in an injection 10 micrograms per milliliter (10 µg/ml) in technetium 99m eluate prepared from Molybdenum 99 formed as a result of uranium fission.